Just like the size of the theater they presented in, the big take-away from the large-scale deployments session was, one size doesn’t fit all. 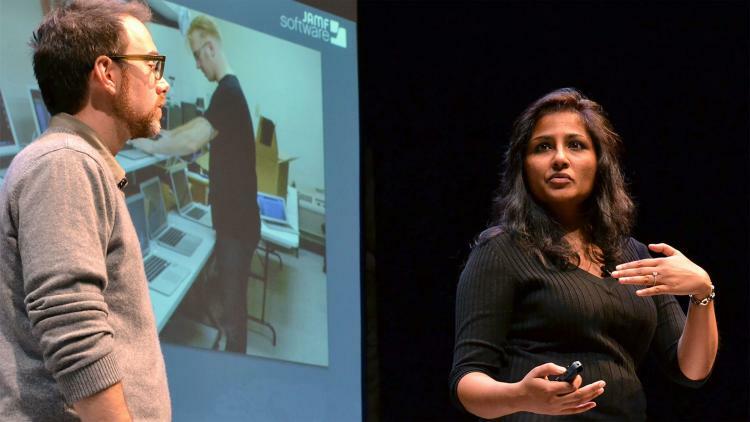 Priya David and Matt Bentley, JAMF members of the professional services team, hosted an overflowing crowd in the Dowling Studio. The duo went through the stages of a successful deployment from solution development through to implementation, and in the process, asked the audience to consider a smattering of questions. Who will own the device? Will the device remain onsite? How many operating systems will you support? Which version(s)? What applications will you be deploying? Attendees walked away with a lot of information to digest, but one theme was prevalent. Victory will not be assured unless you create a positive and empowering experience for your end users.